Before you dig into dessert, try this unique spin on a Caprese salad. It seems that, according to the Internet, the only way to eat the mandated dairy on Shavuot is to indulge in cheesecake. There are lists and collections of every type of cheesy dessert, and while this is perfect for the holiday, it’s not the only option. This year, before you dig into dessert, try this unique spin on a Caprese salad. Instead of mozzarella, treat yourself to squeaky, salty halloumi, a Greek cheese with a high melting point that allows it to hold up to the heat of the grill. The texture of halloumi is markedly different from soft, stringy mozzarella, but it works just as well with the other ingredients. Adding garlic-rubbed croutons gives this dish some heft—but I promise you’ll still have room for dessert. Heat grill to high and preheat, covered, for 15 minutes, until very hot. Clean grill grate. Meanwhile, brush both sides of baguette slices with vegetable oil. Slice halloumi in half, widthwise, so you are left with two ½-inch by 2½-inch thick planks. Brush each plank with oil. Transfer baguette slices to grill. Cook until brown around edges, then turn over and cook until second side browns, about 3 minutes each side. Remove from grill and rub one side of each slice with garlic. Set aside. Transfer halloumi planks to grill and cook until grill-marked, about 3 minutes. Flip over and grill second side until grill-marked. Remove from grill and slice each plank into four strips. Spread arugula on serving platter. Place baguette slices, tomato slices and halloumi decoratively on platter. Season tomato slices with salt and pepper. 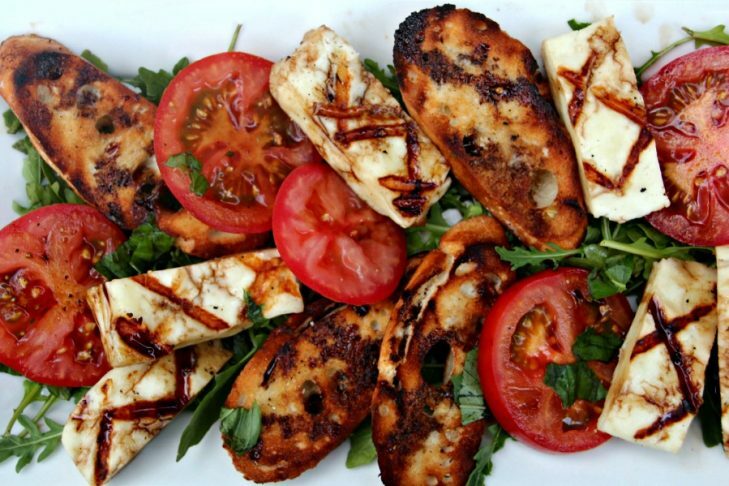 Drizzle platter with balsamic vinegar and sprinkle with torn basil. Serve.